Sony’s Ico transports players into a surreal, dreamlike world unlike any other on the Playstation 2 or any other console to date. The game’s beautiful, impressionist/realistic graphics set a new standard of polish and unrivaled creativity that will be difficult for any developer to beat. Some areas in the game look like nothing less than interactive paintings. The fantastic, original gameplay lends a whole new dimension to the typical video game “save the princess” plot and does so in a manner that is both subtle and sublime. Despite some rather oblique puzzles, this unique game won’t disappoint, as its sheer beauty, scale and creativity make the journey one not to miss. The Laser looks at this intriguing adventure title and unravel the secrets behind of its undeniable brilliance. Only the hardest of hearts won’t find that there are many points in the game where you’ll find yourself sympathizing with the characters, rooting for them to succeed and feeling your heart in your throat when they are endangered. You can literally feel your pulse quicken when Yorda is snatched away by a shadow monster, and the desperation and sweaty palms that ensue as you try to rescue her. This is all impressive enough from a plot standpoint when many titles have the simplest, ineffective stories, but what’s even better is that Ico offers a near flawless mix of tight action sequences and deeply engrossing puzzles making an this an adventure game that represents the peak of gaming design and structure on that succeeds on so many different levels, it’s nothing short of astonishing. Ico’s structure and approach is thoroughly original and innovative, unlike any adventure title to date this game allows for a more contemplative, cerebral approach than most other games. It’s plot unfolds at a dreamlike pace, slowly revealing its mysteries to the player yet giving them more questions than answers. It wouldn’t be fair to go into specifics, but there are certain points where the cinema sequences leave you hanging by a thread with all sorts of possibilities. While it might seem like it from the advertising, Ico isn’t a traditional RPG by any means, so there’s no hit points or spells to worry about which only enhances the realism. You control Ico and have to help him escape from a dark castle where he’s been imprisoned by his village. He was born with horns and has been sacrificed, but by a stroke of luck, a rumble sets him free from his prison and then his quest begins. He sees a beautiful princess imprisoned in a cage and has to figure out a way to free her. The main difference between this and all of the other games in the genre, is that instead of just saving the princess Yorda passively by beating enemies, you have an active role in helping her escape. On you free her, she follows you around the levels and you have to move both her and Ico through the levels. This is done by calling her or holding hands and running with her through the levels. You need to keep her at your side at all times since leaving her alone for any period will cause the shadow monsters to try and grab her. Achieving this is a lot harder than it sounds because of the complex levels which sometimes force you to leave her alone. There are many ingenious, occasionally frustrating puzzles in the game. 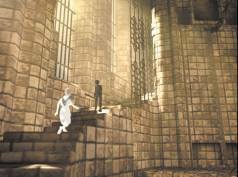 In fact, it’s no exaggeration to say that Ico is basically a large series of elaborate, intricate puzzles. In addition to unlocking the mysterious puzzles and completing the various tasks, you also have to watch out for the shadow monsters who are trying to capture Yorda. If they succeed at pulling her into the portal, your quest ends. This isn’t a simple as it sounds because the monsters are extremely aggressive and have a tendency to gang up on Ico. Battling these enemies requires skill and persistence as well, with multiple hits and many waves of them to face. Some of the battle sequences can be quite strenuous, to the point of near tedium and while they get on your nerves after awhile they do serve to break up what could have been a dry and rather dull experience of box moving and switch pulling. What’s so brilliant about Ico is its seamless integration of the puzzles and action which makes it challenging intellectually and viscerally, giving even the best players a good workout of both sides of their brains. Many of the puzzles are incredibly complex and require multiple steps to complete which is great at some points, but very frustrating because one small mistake and you need to go through the entire sequence. Unfortunately there are more problems since Ico’s more elaborate puzzles can get a bit oblique with shades of Myst. This makes it very difficult to progress and you can find yourself seemingly stuck at certain points. This can slow the pace down to a crawl as you backtrack frequently looking for things and objects you may have missed. Some less experienced players may need a strategy guide to progress, but proceed carefully since the most satisfaction in the game is coming up with solutions that may not be immediately obvious – looking at a solution in a strategy guide should be treated as an occasionally necessary last resort. Fortunately, Ico’s pace gets better once you know what clues to look for which can only come by figuring out puzzles yourself. Even with familiarity with its conventions, ICO is still not the easiest game to beat, it takes concentration and determination – you shouldn’t expect to complete the game in one sitting. There are a few reviewers who have also complained of a seven hour completion time, but this is misleading, and reflects going through the entire game with a walkthrough or a strategy guide. Of course, most players don’t cheat, and will thus spend a lot more time than that just figuring out the puzzles. I personally have spent more than 12 hours on the game and I’m not even half-way through it. While the puzzles can quickly become frustrating making the temptation of cheating very strong, this should be resisted. While the puzzles seem difficult, this is mitigated to a large degree by the numerous save points, which aren’t nearly as punitive as they could have been. And, as always, the satisfaction of winning on your own ability is the key to enjoying Ico, especially since its environment and atmosphere are so unique and mesmerizing and not stopping to soak it in short-changes the experience. The amazing graphics completely immerse the player into a richly detailed environment, the screen shots just cannot do the game justice. Every element in seems to fit together perfectly, giving the game a solid foundation of realism and scale that can be breathtaking or terrifying. This is especially true when you see Ico’s small frame dangling over a massive expanse of space. The sense of epic scale and proportion is simply astonishing with the architectural accuracy of the castle combining with beautiful lighting effects to make this one of the most visually impressive games ever seen. What’s impressive about this is that the environments aren’t static either, they are all fully 3D and interactive, making the world in Ico feel very much alive. 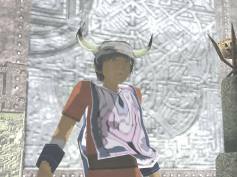 Ico’s character animations give Ico and Yorda highly-developed believable personalities that the player can really relate to – you can tell immediately that Ico is a young boy with an awkward, yet noble appearance, while Yorda’s ghost-like appearance lets her radiate a sense of mystery, vulnerability and sadness that makes it impossible to not want to help her escape from the castle. Even cooler are the shadow monsters, who seem to emerge from out of nowhere, which blue, piercing eyes that radiate a constant sense of menace and determination on their part. The monsters’ animations are beautiful and eerie, they seem to flow through the floors and levels like black liquid, not so much moving as flowing through the scenery as they relentlessly seek to capture and pull Yorda back into the dark world. These adversaries ooze malice and terror as they attack relentlessly. They are a terrifying presence in the desolate castle since they both attack in groups while dwarfing Ico in size and power, further giving the player a sense of the young boy’s desperation and determination in his quest. The animation is really impressive and fluid throughout, giving the game a sense of life that few others have ever come close to achieving. 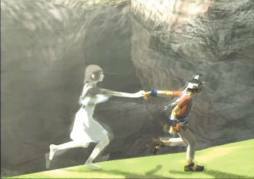 Whether in Ico’s awkward steps and Yorda’s nervous jumps over large gaps, or the way that Ico extends his hand to catch her after a jump, the animation conveys a sense of real people in real space. What’s also impressive about Ico’s aesthetic approach, and one of the elements that really sets it apart from the pack is the game’s intelligent use of sound. Notice the emphasis on sound this is because there’s virtually no music in the game but there is plenty of ambient sounds, such as birds chirping or water falling in the background. Though for long stretches of the game, there’s mainly silence, with only the sounds of your footsteps to keep you company. This gives Ico a real sense of existing in a real world, making for a surprisingly subtle experience. While it’s easy to praise the obvious, Ico’s subtle brilliance is much harder to pinpoint. The restraint that the designers have shown in this area of the game is impressive helps to heighten the sense of dark, loneliness of the castle. This makes the environment seem even more alive and shows how much thought and care goes into making a title that transcends the normal expectations and sets up parameters entirely of its own making. Ico features a surprisingly coherent camera system that works nearly seamlessly with the controls to create a seamless, virtually transparent interface. It’s one of the best for a 3D environmental title that I’ve come across and is basically another element where the intelligent design of the entire game shines. Either in long-range mode or extremely close-in when performing intricate tasks, the camera is very sophisticated and enhances the overall experience instead of hindering it. Where many games stumble badly by blocking your view at crucial points, or giving you an awkward angle, Ico has virtually no points where the camera impedes progress and most of the time, the angles switch in such a way to make things easier. Moving and jumping is simple, and using the back shift key to call Yorda is quite effective. The game uses both analog and digital pads and it’s a good idea to master Ico’s controls and movements early on, since there’s much less room for error on the later levels. This helps the game flow and move at a good pace and allows the player to have a good viewpoint of the entire environment. With such an elaborate system, looking around is an essential skill to learn and luckily it’s easily accomplished. Adding to Ico’s atmosphere, its plot seems to drift slowly like a dream, slowly and deliberately revealing mysteries yet withholding enough to keep you intrigued throughout. Ico is absolutely a classic that has stood the test of time. It's an exceptional game that transcends genres and should be experienced by all gamers. Ico is the result of creativity, innovation, spirit and a pureness that doesn't happen often these days. Rarer still is the game that delivers something extraordinary, with very few missteps along the way. While the puzzles can be a bit frustrating and the battles with the shadow monsters can get tedious, these are very, very minor blemishes on what is one of the most incredible adventure titles ever made. Ico’s outstanding, evocative production design is unparalleled with many breathtaking sequences, specifically one involving a huge windmill, that are astonishing by any measure. With near flawless, richly detailed environments, an incredible artistic vision, uncompromising gameplay and almost-perfect execution, Ico is a landmark title that sets new standards in almost every area. Ico comes as close to perfection as any adventure to date, and is about as close to a masterpiece as has ever been released on any platform.